Today's story is from Nadine Roßa. 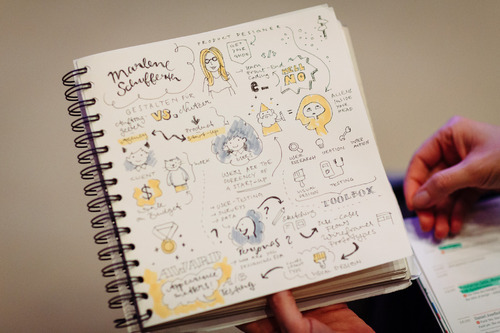 My love for sketchnotes began in 2011 when I first met Eva Lotta Lamm at TYPO Berlin. She was not only a lovely person, she was also carrying a small notebook containing notes on the talks that she attended. But the notes weren’t “normal” ones — i.e. in the form of text on paper – they were rather visual. I was really impressed by what I saw, she basically drew what she heard while she was looking and listening. I was deeply impressed (and yes, she still is my personal sketchnote goddess), and so I started doing the same. What a delight! At the beginning it was a little tricky. I was just not used to listening and drawing at the same time. 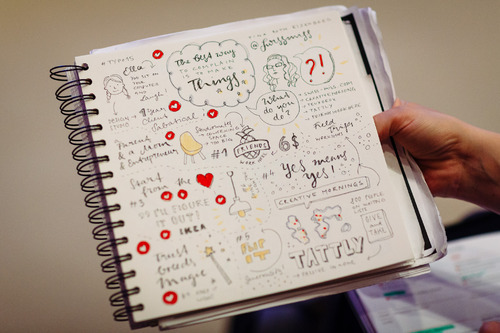 But it took just a couple of talks and there it started – my personal sketchnote love. Meeting Eva-Lotta at that conference four years ago was an eye-opener for me personally. How could I have not known about sketchnotes so far? Actually, when I think about it, I have always done sketchnoting while studying at university, but for some reason, I always forced it into the classical way of writing things down. I guess that’s because I was taught that for such a long time. And now in fact, I can’t imagine taking “normal” notes or visiting conferences without taking sketchnotes anymore. I learned right away that taking sketchnotes really helped me soak up the content of talks. I was more “awake” and concentrated during presentations, and at the end I loved the fact that I had a page that gave an overview of what had been said at a glance. Now that I’ve been sketchnoting for several years, I own several notebooks full of them. And I love them! I like to share my sketchnotes via Twitter, Tumblr and Instagram. In the beginning I just did it, not really knowing why. I am convinced that they are not that interesting for others as the are for me regarding their contents. But I noticed that people really liked seeing them, and that it raised the awareness for the topic of sketchnoting, which now has become a movement. A while ago I had the idea of doing a collection of all the sketchnotes I’d taken over the years, besides just posting them to Instagram and Twitter. I felt like they deserved a special place. The idea behind it was simple. I’d just call it what it is: Sketchnote love. So, I checked to see if the domain sketchnote-love.com was still available. It was. I was really happy about that because I didn’t have much luck with .com domains lately. I took that as a sign. Being a visual designer I started with creating a logo for my new little side project. That is a) a lot of fun and b) at some point I would need it anyways. The idea for that logo was very clear to me right away: a tattoo-ish heart with a pen. And then I needed the website of course. First, I just thought of presenting my sketchnotes but I noticed that would be boring. I remembered people asking me about how I create them, where I start, what tools I use and how I do it. So I made a tutorial for beginners as well. I love seeing other people’s work processes, so I documented the logo process and I added that to site, too. I really love seeing people discovering sketchnotes – even people from fields other than design. I think it is such a good and fun way to take notes. It makes things easier to understand. It also helps to structure our thoughts and ideas, especially when we’re bombarded with information. My hope is that my site will spread the (sketchnote) love all over. "... and that it raised the awareness for the topic of sketchnoting, which now has become a movement. " thanks so much for pointing this out and for sharing this story.